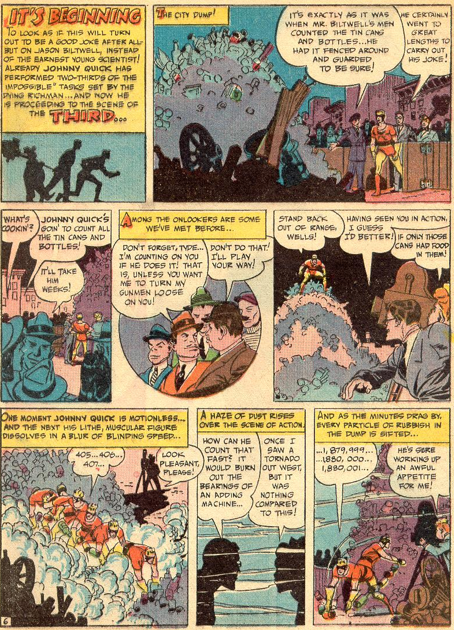 Gardner Fox and Howard Sherman bill this story from More Fun 85 (Nov 42) as the “New” Dr. Fate, and there are some changes to the character, though none as castrating as those which have already occurred. 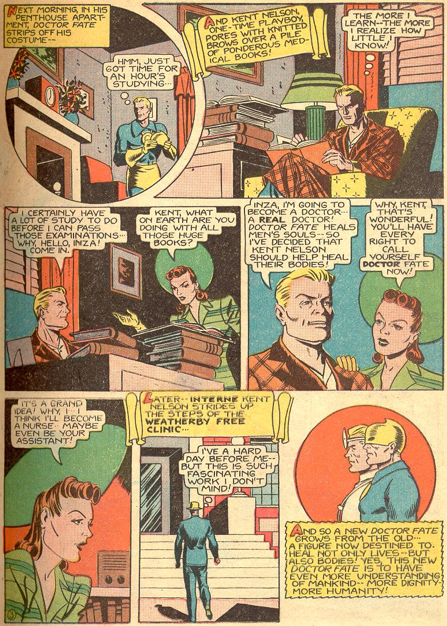 Kent Nelson decides to get a degree in medicine, and achieves that in less than a page. Inza decides to become his assistant (nurse?) but her training is clearly more extensive, as we do not see her function in this capacity during the story. As Dr. Fate, he stops wearing his cape. There also seems to be little of his strength or notion of being able to turn his body into energy or such. He gets knocked out (with ether), then bound and tossed into a corner. No way this would have happened to the character two years earlier. 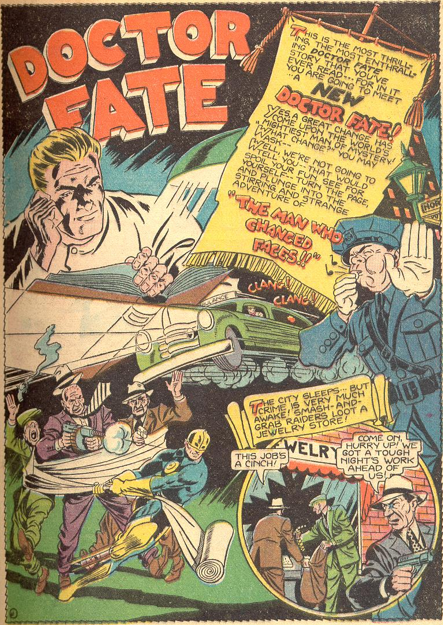 Of course, he gets free and stops the bad guy, who had killed the doctor who did recostructive surgery on his face. The story ends with a bit that cannot help but bring “Inglourious Basterds” to mind, as the bandages come off to reveal that the doctor had carved swastikas all over the criminal’s face. 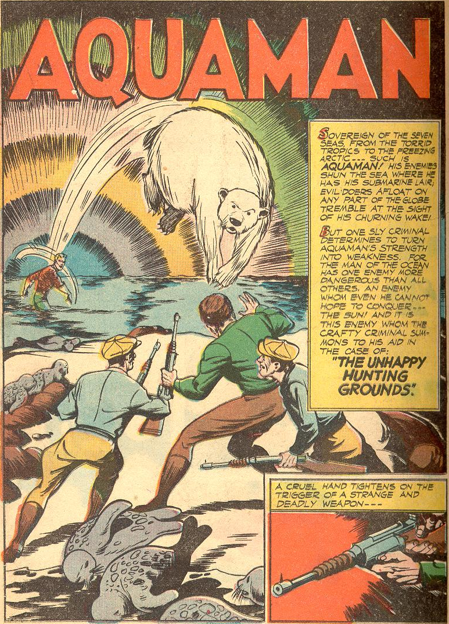 Aquaman goes up against seal poachers in the arctic in this story. 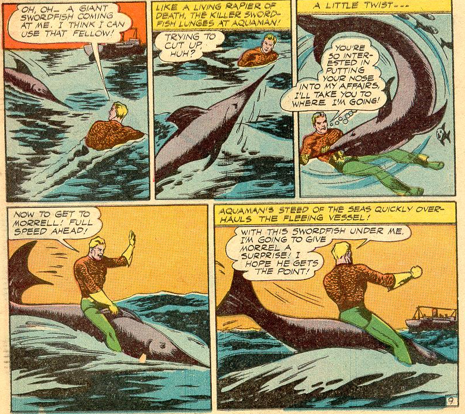 The cold northern setting is quickly forgotten, though, once the hunters capture Aquaman. Then we are suddenly somewhere much hotter, with palm trees. 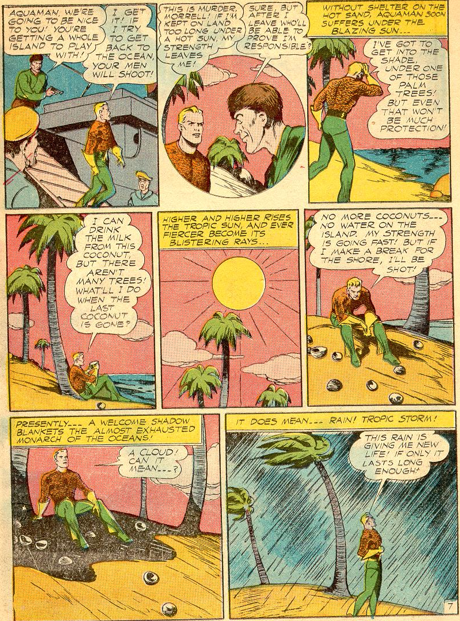 They throw Aquaman onto an island and leave him there to die, shooting at him if he tries to enter the water. Although there is no concept of him dying if he is out of water for a period of time, the story does explain that he “loses his strength” when in the hot sun. This is the first time this idea is really played on, though it will be decades before the one-hour time limit is conceived. He rides a swordfish into his final battle with the poachers. He has to wrangle the fish in order to ride it, though. He shows no sign of being able to mentally command it. In fact, in these early stories the implication seems to be that he can mentally control small fish, crabs and such, but the larger, more aggressive fish are out of his range. 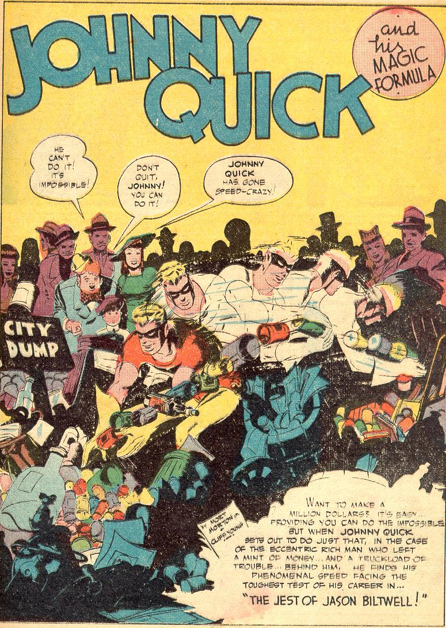 The use of multiple images by Mort Meskin to show Johnny Quick’s super-speed takes hold in this story. 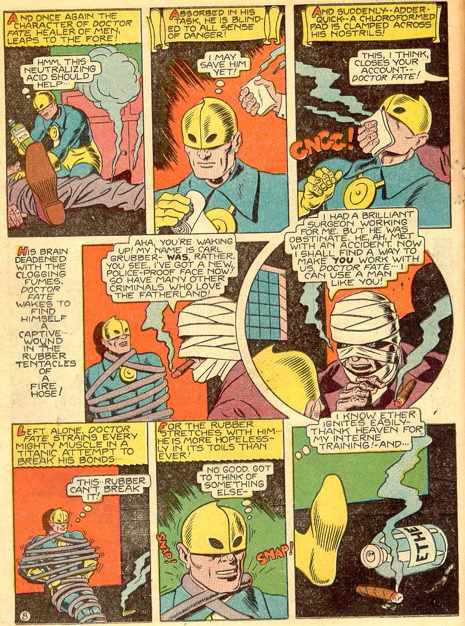 It is used prominently on the splash page, and again in two other panels of the story. 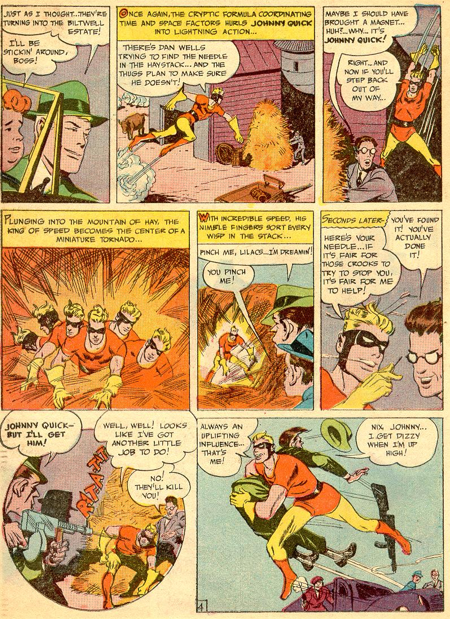 The story itself is pretty much a “task” story, as Johnny endeavours to complete three impossible tasks necessary in order for a man to collect his inheritance. Johnny finds a needle in a haystack, counts can in a garbage dumps and bricks in a tall building, and also takes down the shady lawyer scheming against the heir.